Not all dog foods are created equal. In fact, some dog foods offer much higher quality nutrition than others, so you need to be careful when shopping around. When it comes to finding a good dog food, the quality of the ingredients matters. You should look for whole, natural sources of protein, fat, and carbohydrate to ensure optimal bioavailability. You might even consider buying an organic or natural dog food for your dog. Keep reading to learn more about your dog’s basic dietary needs and to receive some tips for picking the best dog food to meet those needs. You’ll also receive our top 5 picks for the best organic and natural dog food. The term organic is closely regulated by the FDA, but the term “natural” is not. In order to be certified organic, a dog food must be made with organic ingredients free from antibiotics, hormones, chemical fertilizers, pesticides, and preservatives. Organic dog food is all-natural by definition, but not all natural dog food is organic. Quality Protein. Protein is the most important nutrient for any dog and the foundation of a quality organic dog food. Look for animal proteins like meat, poultry, and fish. Digestible Carbohydrates. Not all organic dog foods are grain-free, but they certainly exist. Look for whole-grain carbohydrates or grain-free options like beans, legumes, peas, and vegetables. Supplements. Because the nutritional quality of organic ingredients is very high, organic dog food often doesn’t come with a long list of synthetic vitamins and minerals. Even so, you should look for beneficial supplements like chelated minerals and probiotics. 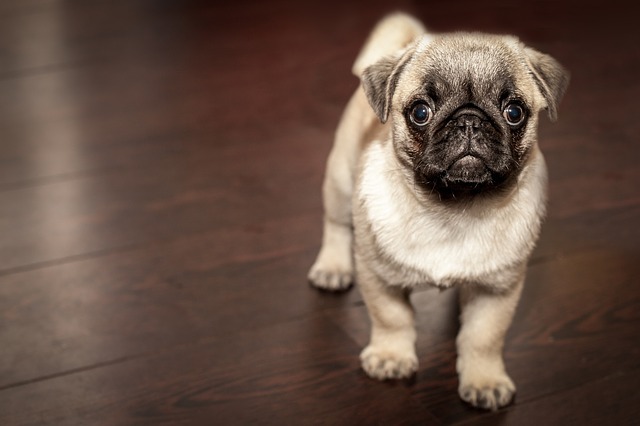 All dogs require a minimum of 18% crude protein and 5% crude fat in their diets – or 22% and 8% for puppies. Because dogs are primarily carnivorous by nature, the bulk of their nutrition should come from animal sources like organic meat, poultry, and fish. Animal proteins are complete proteins which means that they contain all 10 essential amino acids that your dog needs. Animal fats are also easier for your dog’s body to metabolize than plant-based fats. In addition to high-quality protein and fats, your dog needs healthy carbohydrates as well. Organic whole-grains like brown rice, oatmeal, and cracked pearled barley are all good option. If your dog is allergic or sensitive to grains, however, you might try organic vegetables like peas and sweet potato or beans and legumes. Make sure your dog gets at least 3% dietary fiber but no more than 5%. To ensure that your dog’s nutritional needs are met, most organic dog foods will contain beneficial supplements like vitamins and minerals. Chelated minerals are the best because they have been chemically bound to protein molecules to increase absorption. 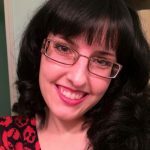 Probiotics are also a benefit. Keep reading to see our top 5 recommendations for the best organic dog food. Finding an organic dog food is fairly easy because it will say the word “organic” right on the label. Keep in mind that there are specific requirements to use this term, so check the label for the important information discussed above to make sure the claim is accurate. All Ingredients Dehydrated: Free-Range Chicken, Organic Barley, Potatoes, Organic Flax, Organic Oats, Green Peas, Carrots, Bananas, Parsley, Organic Kelp, Celery, Tricalcium Phosphate, Choline Chloride, Zinc Amino Acid Chelate, Vitamin D3 Supplement, Vitamin E Supplement, Potassium Iodide, Potassium Chloride, Iron Amino Acid Chelate, Copper Amino Acid Chelate, Sodium Selenite, Thiamine Mononitrate, DHA, EPA. 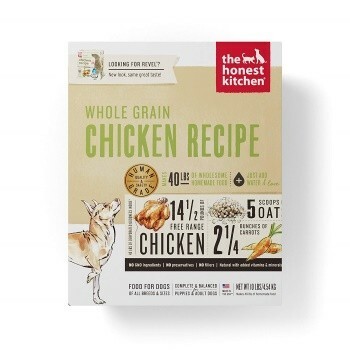 When it comes to quality nutrition, you can’t do much better than The Honest Kitchen Human-Grade Dehydrated Dog Food. This dog food features organic carbohydrates like barley, flaxseed, oats, and peas with organic fruits and vegetables to provide nutritional balance and dietary fiber. The main ingredient is dehydrated chicken which is a rich source of complete protein as well as glucosamine and chondroitin. This particular recipe offers 24.5% crude protein with 14% fat and, because it is dehydrated and not cooked, the raw ingredients retain more of their original nutritional integrity. Chicken, Organic Barley, Organic Oats, Organic Peas, Chicken Meal, Organic Sorghum, Organic Soybean Meal, Chicken Fat (Preserved with Mixed Tocopherols), Organic Brown Rice, Organic Millet, Organic Rice, Organic Flax Seed, Dicalcium Phosphate, Organic Carrots, Natural Flavors, Salt, Calcium Carbonate, Potassium Chloride, Dried Kelp, Parsley, Zinc Proteinate, Choline Chloride, Iron Proteinate, Vitamin E Supplement, Rosemary Extract, Manganese Protienate, Lecithin, Copper Proteinate, Vitamin B12 Supplement, Vitamin A Acetate, Niacin, Calcium Pantothenate, Vitamin D3 Supplement, Ascorbic Acid (Source of Vitamin C), Riboflavin, Folic Acid, Pyridoxine Hydrochloride, Thiamin Hydrochloride, Biotin, Cobalt Proteinate, Ethylenediamine Dihydriodide (Source of Iodine), Sodium Selenite, Dehydrated Lactobacillus Acidophilus Fermentation Product, Dehydrated Bacillus Subtilis Fermentation Product, Dehydrated Bifidobacterium Thermophilum Fermentation Product, Dehydrated Enterococcus Faecium Fermentation Product. 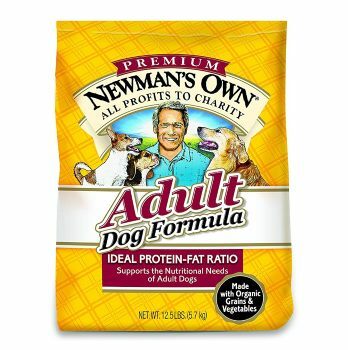 If you’re looking for a decent quality organic dog food that won’t break the bank, try Newman’s Own Adult Dog Food. This recipe offers the ideal ratio of protein-to-fat to support lean muscle mass while also meeting your dog’s needs for energy. Made with organic grains, fruits, and vegetables, this recipe is complete and balanced for adult dogs. It features chicken as the primary protein with chicken fat as a nutritious source of healthy fats. It also contains dried fermentation products for probiotic support as well as chelated minerals. 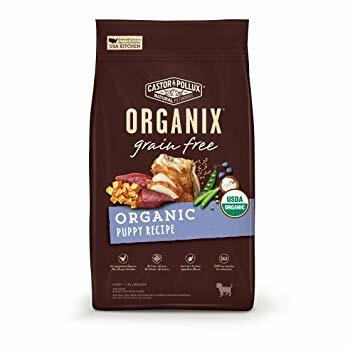 Choosing an organic puppy food like this Castor & Pollux Organic Grain-Free Puppy Recipe is a great way to start your puppy off on the right food. Made with organic, free-range chicken as the first ingredient, this recipe also features organic sweet potatoes, organic chickpeas, and organic coconut oil. All in all, it provides 25% protein and 14% fat with 5% crude fiber for digestion. It also contains DHA for healthy brain development and superfoods for nutritional balance. Organic Chicken, Organic Chicken Meal, Organic Sweet Potatoes, Organic Chickpeas, Organic Peas, Organic Tapioca, Organic Pea Protein, Organic Sunflower Seed Meal, Organic Flaxseed, Organic Coconut Oil, Organic Chicken Fat (preserved with mixed tocopherols), Natural Flavor, Organic Chicken Liver, Organic Blueberries, Organic Alfalfa Meal, Organic Sunflower Oil, Salt, Salmon Oil, Vitamins (Vitamin E Supplement, Niacin Supplement, Thiamine Mononitrate, d-Calcium Pantothenate, Vitamin A Supplement, Pyridoxine Hydrochloride, Riboflavin Supplement, Vitamin D3 Supplement, Biotin, Vitamin B12 Supplement, Folic Acid), Choline Chloride, Minerals (Zinc Amino Acid Complex, Iron Amino Acid Complex, Copper Amino Acid Complex, Manganese Amino Acid Complex, Sodium Selenite, Calcium Iodate), Potassium Chloride, Dried Bacillus coagulans Fermentation Product, Organic Rosemary Extract. As your dog gets older, his metabolism will slow down, but his need for quality nutrition won’t change. 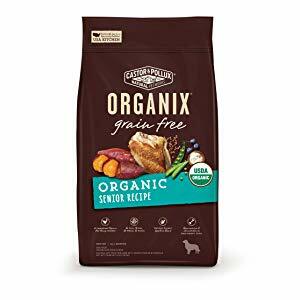 This Castor & Pollux Organic Grain-Free Senior Recipe is a great choice because it is formulated specifically for seniors and made with wholesome organic ingredients. The main ingredient is organic, free-range chicken and it is accompanied by organic grain-free carbohydrates and healthy fats. It is also supplemented with plenty of fiber for healthy digestion and superfoods for nutritional balance. 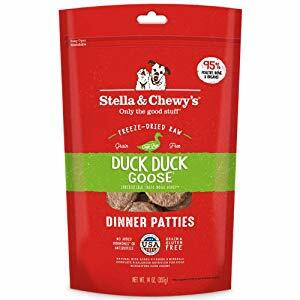 If you’re looking for an allergy-friendly dog food made with organic ingredients, try Stella & Chewy’s Freeze-Dried Dinner Patties. These freeze-dried patties feature fresh duck and turkey as the primary proteins with organic fruits and vegetables for nutritional balance. Every ingredient is of the highest quality with proteins being cage-free and inclusive of meat, organs, and bone. This recipe also features chelated minerals to ensure optimal nutrient absorption as well as probiotics for healthy digestion. The best part, however, is the fact that it is freeze-dried instead of cooked. This means that the ingredients retain more of their original nutritional integrity which gets passed on to your dog. The amount you feed your dog depends on its age, weight, and breed. Large-breed dogs eat more food than smaller dogs, but small dogs require more calorie-dense food to support their fast metabolism. 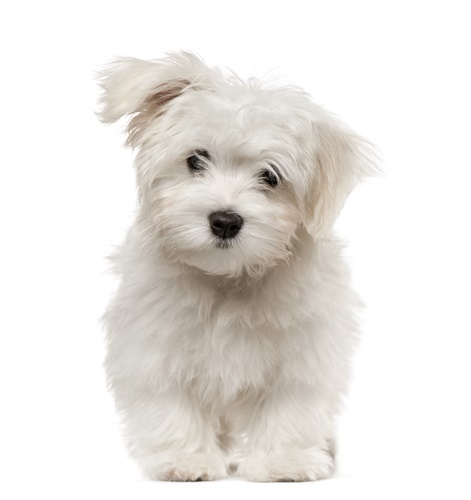 The best thing to do is choose an organic dog food formulated for your dog’s breed size. From there, check the feeding instructions on the label according to your dog’s age and weight. 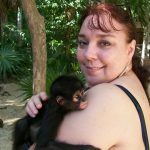 This will tell you how much to feed your dog each day, and you can divide it into two or three meals. Feed large dogs two meals a day and small dogs or puppies three meals a day. 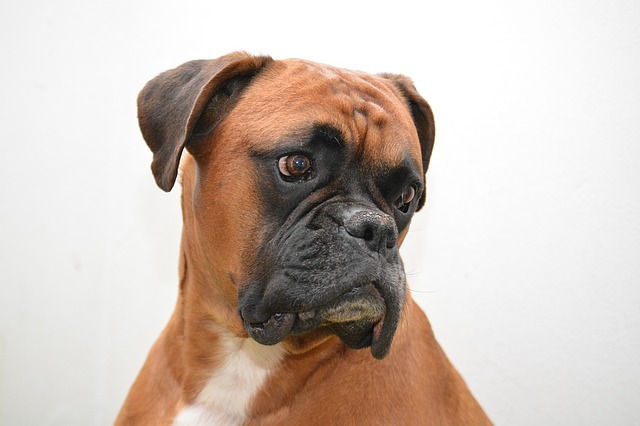 Any dog can develop a food allergy or sensitivity, though some breeds are more highly prone than others. Low-quality grains and fillers like corn, wheat, and soy are some of the most common food allergens, as are proteins like beef and pork. Sensitivities can also be triggered by artificial additives. Fortunately, organic dog food is usually free from artificial additives, but you still need to look out for potential allergens. If your dog has allergies, try a limited ingredient or grain-free organic dog food. If you can afford to feed your dog organic dog food, by all means, go for it! Though you still need to shop smart, you can rest easy knowing that the quality of most organic dog foods is very high. You also need to keep your dog’s individual preferences in mind. To make sure your dog gets the best organic dog food you can find, try one of the products we’ve reviewed above. Best of luck!